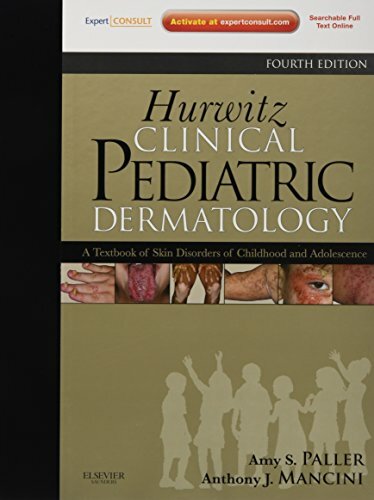 Hurwitz Clinical Pediatric Dermatology, by Amy S. Paller, MD and Anthony J. Mancini, MD, gives you easy access to the practical, definitive guidance you need to expertly identify and manage all types of skin disorders seen in children. Continuing the legacy of Dr. Sidney Hurwitz’s beloved reference, it covers all pediatric dermatoses in a thorough, yet efficient and accessible way, enabling you to get the answers you need quickly and provide your patients with the most effective care. This edition brings you up to date on the latest classification schemes, the molecular basis for genetic skin disorders, atopic dermatitis, hemangiomas, viral disorders, bites and infestations, hypersensitivity disorders, collagen vascular disorders, bacterial and fungal infections, psoriasis, contact dermatitis, and much more. A thousand full-color photographs help you to recognize the characteristic manifestations of every type of skin disease. And, full-text access at www.expertconsult.com allows you to rapidly search the book online with downloadable illustrations. Hurwitz remains the indispensable pediatric dermatology resource you need for optimal practice.Access the complete contents online at www.expertconsult.com, rapidly searchable, and downloadable clinical photographs. Efficiently locate the answers you need with a remarkably concise, practical, clinically focused reference that minimizes redundancy and offers an ideal ratio of text to figures and tables. Overcome challenges in pediatric dermatology with confidence with a wealth of clinical "pearls" from Amy S. Paller, MD and Anthony J. Mancini, MD - esteemed leaders in the field who possess significant experience in both research and clinical practice. Stay on the cutting edge of the latest diagnostic, therapeutic, and research advances with updated and expanded coverage of the most recent classification schemes, the molecular basis for genetic skin disorders, atopic dermatitis, hemangiomas, viral disorders, bites and infestations, hypersensitivity disorders, collagen vascular disorders, bacterial and fungal infections, psoriasis, contact dermatitis, and much more. Recognize a wide range of pediatric diseases thanks to a completely revised image library with over 370 new clinical images – more than 1,000 in all - fully accessible via the online image gallery at www.expertconsult.com!Hurwitz provides the easiest access to the information you need to diagnose/treat the dermatologic ailments of your pediatric patients.